(Nanowerk Spotlight) Counterfeiting of bank notes has always been a problem and central banks are leading a high-tech fight against sophisticated counterfeiting operations. For instance, when the European Central Bank (ECB) designed its new banknotes, they included a variety of security features – holograms, foil stripes, special threads, microprinting, special inks and watermarks. Nevertheless, there were rumors already at the start of the euro that the ECB was working on embedding radio frequency identification (RFID) tags to further enhance security. A RFID tag's ability to read and write information to a banknote could make it very difficult, for example, for kidnappers or bank robbers to ask for 'unmarked' bills. A tag would give governments and law enforcement agencies a means to literally track these bills. So far, though, this project hasn't delivered. While the integration of RFID technology on a banknote is technically possible, no banknotes in the world today employ such a technology. The biggest hurdles appear to be price and reliability over the life span of a banknote. The two basic components of an RFID tag that are required are a chip and an antenna. The antenna acts as a communication link between the RFID tag and the rest of the world while the chip carries out all the necessary protocols, data encoding, reading/writing from memory. "Most passive RFID tags don't have an integrated power source and they receive their power from a radio signal," Husam Alshareef, an associate professor in material science and engineering at King Abdullah University of Science & Technology in Saudi Arabia, explains to Nanowerk. "This means they cannot always perform a memory refresh operation. For applications in banknotes this means the memory used in RFIDs should be non-volatile and rewritable in order to effectively complement logic and sensing elements to provide the desired circuit functionality. Further it should be cheap, flexible, robust and have good retention properties. And fabricating such memory devices on banknotes has been the biggest hurdle so far." In recent work, Alshareef and his group have now fabricated the first-ever all-polymer, non-volatile, ferroelectric memory on banknotes. As the team reported in a recent edition of Advanced Materials ("High-Performance Non-Volatile Organic Ferroelectric Memory on Banknotes"), their devices demonstrate excellent performance with high polarization (∼8 µC/cm2), low coercive fields (50 MV/m), low operating voltage (∼4 V), high mobility (∼0.12 cm2/Vs), large memory window (∼8 V) and good retention properties. 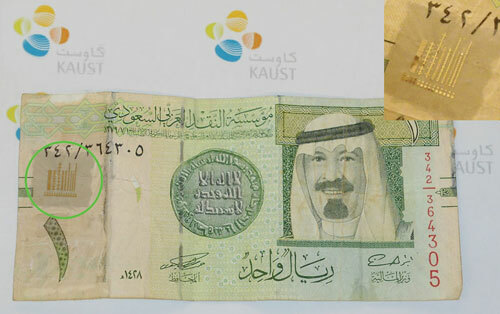 "A major challenge with using banknotes is their rough fibrous surface, which necessitates adding a planarization layer to render the surface amenable to electrode and active layer deposition," says Alshareef. "We overcame this problem by applying a planarizing layer of polydimethylsiloxane (PDMS). In addition to acting as the planarizing layer PDMS provides other important roles such as providing adhesion and strain isolation for the devices above. A key feature of PDMS layer is that it penetrates deep into the fibers of substrates such as banknotes, thus providing strong adhesion without chemical bonding." Alshareef notes that the performance of their banknote tags is comparable to previous records of pentacene-based ferroelectric transistors on other substrates such as silicon and plastic. "Furthermore, we have shown the performance of polymer electrodes to be on par with metal electrodes for these ferroelectric devices even at high frequencies of 1 MHz" he says. "We achieved this by carefully doping the polymer electrodes to increase the conductivity by almost 3 orders of magnitude. This opens the possibility of using these polymer electrodes as cheap, flexible and transparent global interconnects for such memory circuits." These memory devices may be used for other kinds of electronic circuits ,sensors, displays etc on rough surface like paper or textiles. The relevance for the banknote security industry is that these results suggest that the fabrication of high performance non-volatile polymer memories on banknotes is possible – albeit not practical yet. 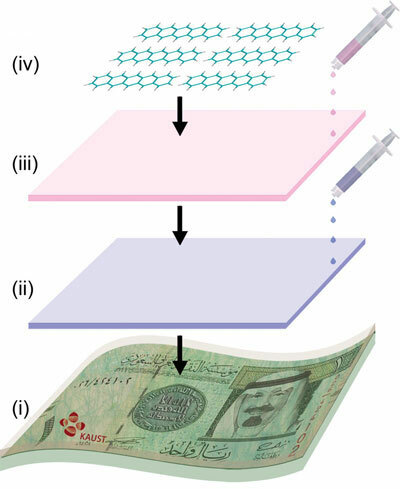 Alshareef cautions that, in order to make organic electronics on banknotes commercially viable, much work still needs to be done in optimizing printing techniques, improving mechanical integrity, and devising appropriate encapsulation layers.